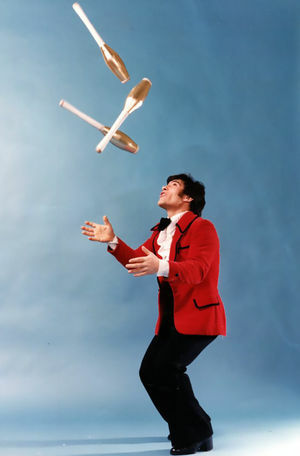 Nino Frediani (1940-2018) had been billed "The World’s Fastest Juggler." He was indeed a spectacular and energetic juggler, working at great speed in the "Spanish style" popularized by Francis Brunn. Which was not advertised, however, is that he was born with a chronic dystrophy of the optic nerve, and was considered legally blind! Nonetheless, he was a superb and precise technician, working with only three small balls, three large balls, three clubs and three rings, but choosing perfection and difficulty over quantity. Nino Frediani was born January 29, 1940 in Lisbon, Portugal, in the circus where his parents were working. His father was Augusto "Zizine" Frediani, a former star equestrian who had been the top-mounter in the three-man-high column that he performed on horseback with his brothers in the history-making jockeyClassic equestrian act in which the participants ride standing in various attitudes on a galoping horse, perform various jumps while on the horse, and from the ground to the horse, and perform classic horse-vaulting exercises. act of The Fredianis. His mother was Bertha Pauwels, a versatile performer who came from a well-known French circus family. Nino made his performing debut in Milan at age fourteen, in 1954, in an acrobatic duet titled I Due Vagabondi (The Two Vagabonds), in which he partnered with his father. Augusto wanted to make his son an acrobat, but Nino had other ideas and, unbeknownst to his father, he practiced juggling on his own. Then, opportunity knocked at Paris’s Cirque d’Hiver, where Joseph Bouglione needed a quick replacement for the juggler Sampion Zurani: Nino’s act was ready and he made his juggling debut at the fabled Parisian circus. Success came immediately and his career was launched. Nino began working internationally in circus, variety and cabarets, and eventually settled in England, where, in the 1960s, there was still a lot of work in music-halls, circuses and variety shows. In 1967, he met Bob Hope, who had come to perform in a Royal Variety Performance at the London Palladium. Nino went with him to Saigon to perform in a USO show for the American troops during the Viet-Nam war. In 1974, it was the turn of Nino and his wife, Wendy, to be invited to a Royal Variety Performance at the London Palladium, in presence of the Queen Mother. In the 1970s, work had become scarcer in Nino’s adopted country, but he could now find engagements all around the world; his tours took him as far as Asia and Australia, which he visited several times. Finally, in 1981, he landed in Las Vegas, where his act was featured in a show at the legendary Flamingo Hotel and Casino. Nino Frediani settled in Las Vegas and remained a featured attraction(Russian) A circus act that can occupy up to the entire second half of a circus performance. in the Flamingo's shows for a record seventeen years, until 1998. He continued to work in Las Vegas and abroad, and he participated in special events until the 2010s. He passed away in his adopted town on November 23, 2018 at age seventy-eight. He had been married to his wife, Nikuko, for more than twenty years; his very talented son, Romano Frediani, followed in his footsteps, and has become a well-known juggler.